BjÃ¶rgvin Karl GuÃ°mundsson is a three-time CrossFit Games veteran with a career-best finish of third place in 2015. 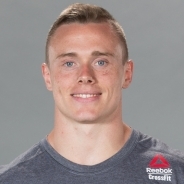 A former gymnast and soccer player, GuÃ°mundsson took ninth in his first appearance at the Europe Regional in 2013, going on to make his Games debut in 2014 with a 26th-place finish. GuÃ°mundsson is a trainer at CrossFit Hengill in Hveragerdi, Iceland.